www.cementamericas.com • Fall 2018 • CEMENT AMERICAS 41 FEATURE job site, typically because they fail to meet the specified slump at the time of delivery. The returned concrete is either crushed and used as road base, made into blocks, or simply discarded. All these sce- narios require additional time, fuel use and a duplication of the load of concrete. 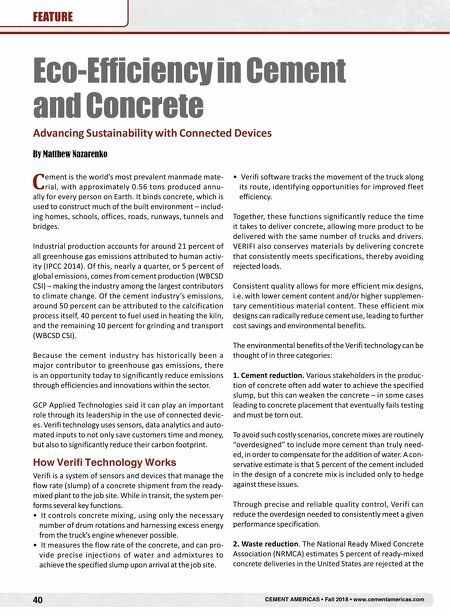 Because Verifi software monitors concrete consistency in transit, and controls precise injections of water or admix- tures en route, the concrete is delivered more consistently within performance specifications. Early data indicates that this could reduce rejection rates from 5 percent to 3.8 percent – saving time, money and materials. Since a typical concrete load represents 5,500 lb. of carbon dioxide emissions, reducing concrete waste also benefits the environment. 3. Fuel efficiency. In ready-mixed concrete delivery, fuel use is a significant source of cost and environmental impact. Approximately 23 percent of fuel in a concrete delivery is used for high-speed drum rotations that mix the concrete. The timing of these rotations is typically controlled by the truck driver – based on minimal information about con- crete consistency or fuel efficiency. In contrast, Verifi soft- ware gives the driver instructions on the optimal number and timing of rotations. Early data suggests that the num- ber of high-speed revolutions can be reduced by 10 per- cent, representing significant cost reductions and associat- ed environmental benefits. The advantages described above reduce cost, maintain crit- ical performance specifications, and significantly improve environmental performance. In addition, truck drivers using Verifi software have less need to climb a ladder next to a spinning drum – a clear and important safety benefit. 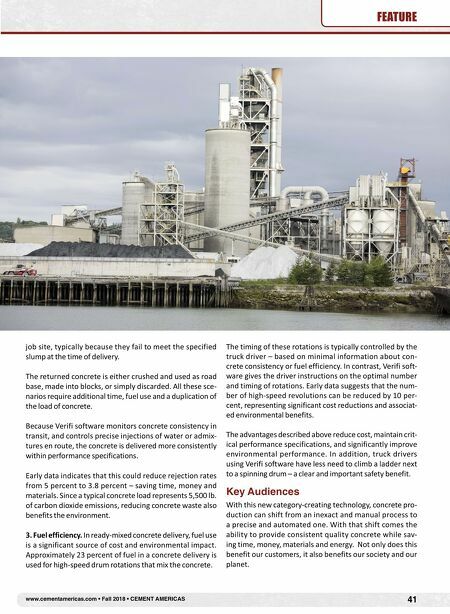 Key Audiences With this new category-creating technology, concrete pro- duction can shift from an inexact and manual process to a precise and automated one. With that shift comes the ability to provide consistent quality concrete while sav- ing time, money, materials and energy. Not only does this benefit our customers, it also benefits our society and our planet.